You all have been marvelously and wonderfully gracious to post in the guest book and sign up to become official Smithellaneous Followers. As this blog finishes out its first weekend of existence, I want to thank you all for the lovely welcome to Blogger-ville! Steve has spent the past four days performing in a Passion Play at Whitley Church , the church we're attending. (Whitley's pastor, Ferrell Hardison, is a wonderful guy who we've been friends with for over twenty years.) 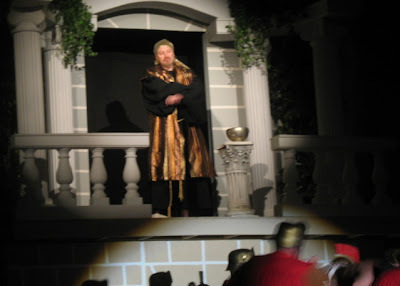 The performances were packed and the church staff estimates the play was seen by around 3200 people in four performances. 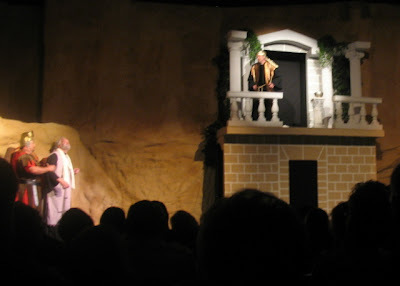 At the beginning of the play, Steve had an off stage speaking part as the angel who stopped Abraham from sacrificing Isaac. At just the right moment, when Abraham was drawing his knife, Steve commanded authoritatively into the microphone, "Abraham! Abraham! Do not harm the child in any way!" At any rate, I was not having good feelings about all the sneezing stuff because I just didn't think that a sneezing angel would benefit the drama in any positive way. Can you imagine an angel proclaiming ponderously, "Abraham! Abra-ACHOO?" In the last scene of the play, he did a great job of playing a cocky, contemptuous judge. I got a few pictures of him in that role and am now going to attempt--for the very first time in my very own personal history of the world--to post them here on Blogger. Wish me luck! Today after the performance he morphed from cocky judge into the guy who comes home to carve the ham for Easter lunch! (Wait a minute. Do you carve ham or just turkey? Hmmm. I'm not sure.) Let's just say that he cut the ham up into slices. I certainly can't go wrong with that description! Our family had a lovely Easter meal in the dining room (instead of the kitchen) using our nicer plates and silverware. Before eating, we joined hands to pray and Steve expressed his love for each of us in a very special and dear way. It was such a great blessing, on this beautiful Easter day, to be a part of a family that has created such a joyful circle of love. Wishing the entire Smith family a blessed Easter. Love the new blog. Hi Becky...Happy Easter to all the Smith gang!! I love your new blog site.I really like the family pictures, especially little snowy. Tell Steve I think he is very talented to be such an awesome play, especially with his sneezing issues. Happy Easter to the Smith family! God Bless all of you!! Hoping your Easter was awesome. This is my favorite day .. We are so blessed to be able to worship freely. May God continue to bless your family. Love the page. I have followed your blog for sometime and enjoy your writing so much. I have never commented but wanted to say have a blessed Easter. Blessings this Easter. What an appropriate season to start your new blog, the blog that will tell the story of your move and your new lives starting. Congratulations on the new blog. I mostly just lurk here, but really love your writing and stories! Long time reader, I wanted to help you make your goal! Congrats on 100 comments. What a glorious Easter! I love the new blog! I think I have it now! Thanks for the help, Becky! I LOVE the site and can't wait to read more Smith stories. Have been following your blog on the other site for quite some type, and usually play the lurker type, but wouldn't want you to miss your goal on Easter weekend! Just another wanna be 100er. Happy Easter to the Smith family. Also, congratulations on the new blog, it looks great! Happy Easter Smith Family! Congrats on the new blog. Great name! Hey becky, love the new blog. Very stylish. Hope you surpass your goal of 100. Happy Easter to the Smith family. Woo-hoo! Clear as mud, or not, I GOT it, so here's me, signing in! Thanks for "splaining." God bless and Happy Resurrection Day! Jenny (the Idaho Techno-Babe - NOT!). Um, sliced the ham, Becky. Just sliced the ham. Nothing fancy, no opportunity here to use your amazing gift of words. Sliced. The. Ham. Okay, this leaves how many left to sign?? Come on, people. I'm running out of things to say! Love the blog! Happy Easter. becky! you rock. love the new blog. i'm glad to hear that easter was a lovely day for the NC smith clan. Welcome to Blogland. What a LOVELY blog Becky. I have been following you for a few years on Caringbridge and have looked forward with anticipation to your blog. Congrats on 100 posts! Happy, happy Easter!! God bless your whole family. This blog is great and you did a terrific job! I have not had a chance to read all the parts but will enjoy doing so. I have to get use to this because I tried earlier and lost the comment. I tried to put a picture on friends and it kept telling me it would not accept it. Oh, well, I keep trying. Hope all had a Happy Easter. I have been in Atlanta for the past three days so just had a chance to get on tonight. I love the new blog. Congrats. It looks great. Hope you have all had a lovely and blessed Easter. Happy Easter to your whole family. So sad that I wasn't on yesterday to be one of the first blog signers. BTW great blog!